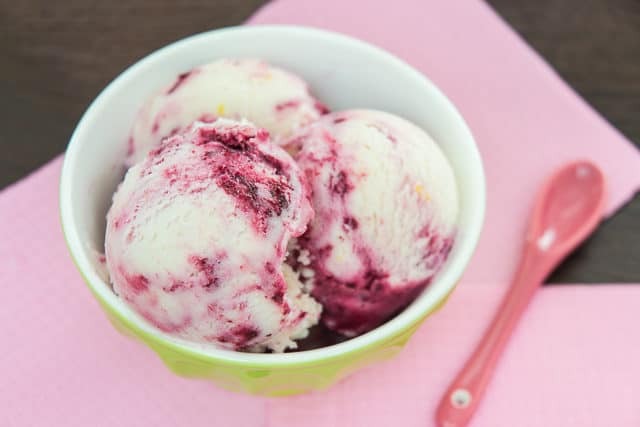 This Raspberry Frozen Yogurt is incredibly creamy with lots of bright raspberry and lemon flavor throughout. It’s the perfect make-ahead dessert for summer! That’s how ice cream queen Jeni Britton, the original creator of this recipe (who I met on my Columbus trip and totally girl-crushed on), opened up talking about this frozen goodness. She hits the nail on the head with that quote. 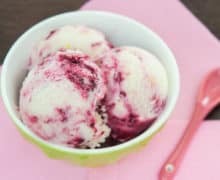 This frozen yogurt feels every bit as creamy and scoopable as ice cream, but with a much more tangy overall experience. It’s very fruity, bright, and summery! This frozen yogurt actually reminds me of the world-famous Berthillon ice cream I ate every day in Paris. If you’ve never been there, they give you 3 golfball-sized scoops for $8 and you give them the death stare for ripping you off, but then you taste it, forgive, and go right back for 3 more scoops. Why? Because every teaspoon is bursting with intense, fireworks-on-the-palette flavor, and it’s mind blowing. The same is true here. There’s plenty of lemon and raspberries in here and it’s total flavor city. 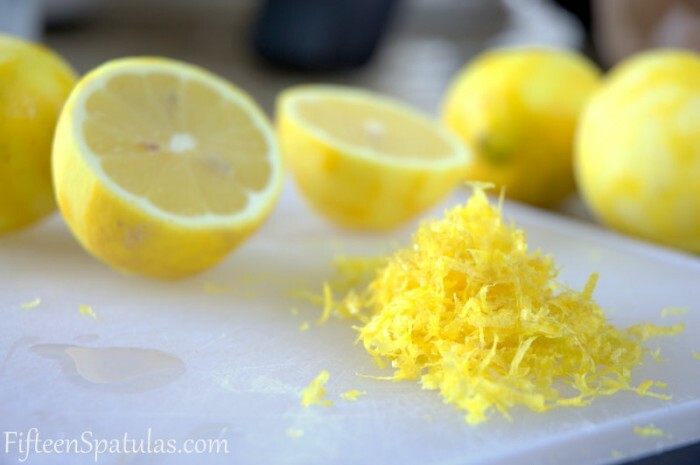 To start building that intense flavor, start by squeezing a whole lot of lemons, and gathering some of that flavorful lemon zest. Take some of the freshly squeezed lemon juice, pour in a packet of gelatin, and let it bloom. Meaning, the gelatin will absorb the liquid, ensuring a smooth texture in your end product. By the way, gelatin is a standard ingredient for frozen yogurt. It stabilizes the frozen yogurt’s texture and reduces crystallization. Add the bloomed gelatin to a boiled mixture of sugar, corn syrup, and lemon juice, then add yogurt, lemon zest, and cream. 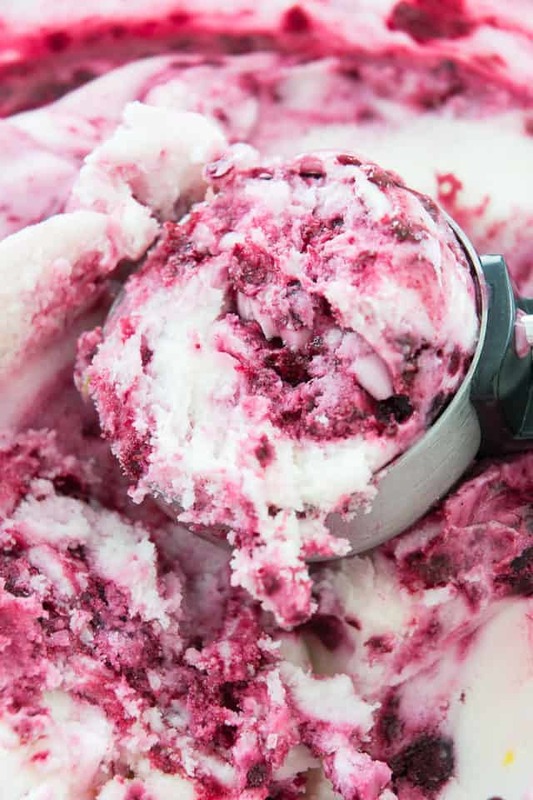 Alternate scoops of the frozen yogurt with raspberry or blueberry sauce, and give it a good swirl with a knife. Pop in the freezer for 2-4 hours until completely frozen. Next time try Biscoff Ice Cream, Pumpkin Ice Cream, or these Mint Chip Gelato Sandwiches. Enjoy! 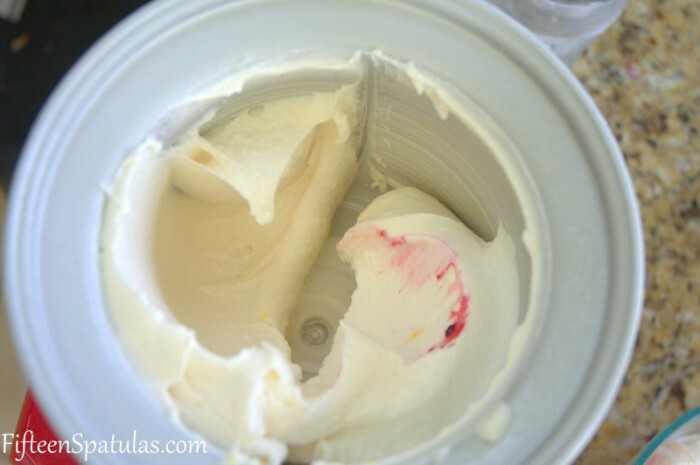 This Raspberry Lemon Frozen Yogurt is incredibly creamy with lots of bright, fruity flavor throughout. 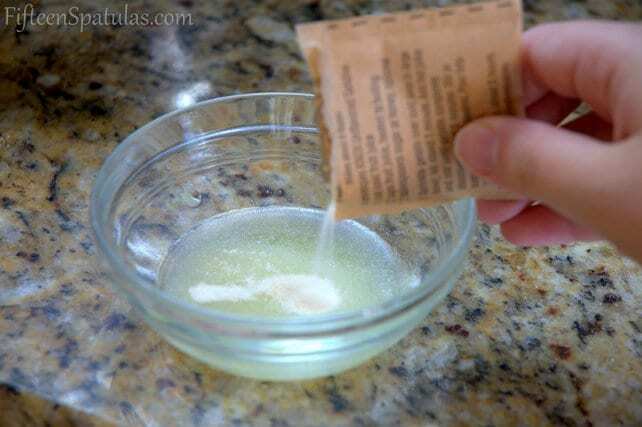 Pour 5 tbsp of the lemon juice into a bowl, and sprinkle in the gelatin. Allow the gelatin to sit for 5 minutes. In a saucepan, bring the rest of the lemon juice, 2/3 cup sugar, and corn syrup to a boil over medium heat, and cook for a minute or two until the sugar dissolves. Remove from the heat and stir in the lemon gelatin. Mix together the yogurt, lemon zest, and cream in a large bowl, and add the saucepan mixture. Whisk until smooth, then place this mixture in an ice bath for 20 minutes, until chilled. In the meantime, boil the berries with 6 tbsp sugar over medium high heat until dissolved and saucy (this should take about 5 minutes). Let cool. 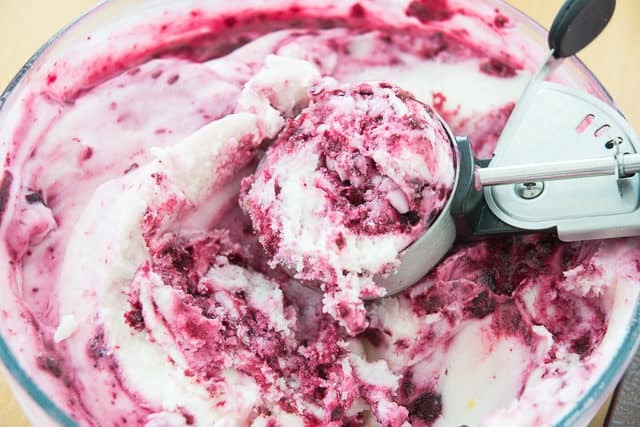 Churn the frozen yogurt in an ice cream machine for about 20 minutes, then place the frozen yogurt and cooled berry sauce in alternate scoops into a container, and swirl with a knife to your liking. Place in the freezer for an additional 2-4 hours until completely frozen. Enjoy! Recipe adapted from Jeni’s Ice Cream on Food & Wine. Recipe updated in July 2018 with more writing and tips. Originally published May 2012. Thanks CJ!I love the tang, yogurt is great! This post is amazing. We have frozen yougurt everywhere in Europe and I miss it so much. Can you make it without an ice cream machine? Hi Sara! You know, I’m not sure of a way you can do frozen yogurt without an ice cream machine. I googled “frozen yogurt no ice cream machine” but the results looked kind of..well, I didn’t find any I thought I could recommend based off pictures (the yogurt looked really…like in jagged pieces instead of creamy and smooth). Sorry I don’t have a better answer!